From award-winning director, stage and cinema actor Denis Podalydès, this classic tale of hijinx comes to cinemas nationwide from the renowned Comédie-Française stage. 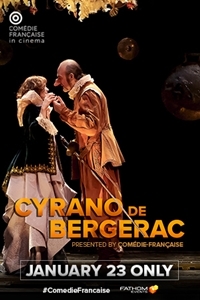 Cyrano de Bergerac, despite a deformed and enormous nose, proves to be a talented swordsman and a man of great wit. In a local pastry shop, the precious Roxane, with whom Cyrano is secretly in love, reveals to him that she loves a young nobleman named Christian.